Crossing off another item on my 30 Before 30 list, #20: Learn to solve a Rubik’s cube. 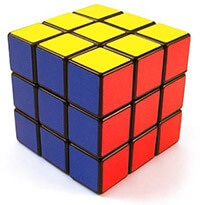 Until recently I’d never even tried to solve a Rubik’s Cube. It kind of scared me and, after looking at one, didn’t make a whole lot of sense. I wish I could say I’m one of those people that could just see one and instantly understand how to solve it. Even when following directions, I had some trouble. But, after about two weeks of constantly working at it, I can consistently (and excitedly) solve a Rubik’s cube every time I try. For those also not naturally Rubik’s Cube gifted, here is the tutorial I used: How to Solve a Rubik’s Cube. It had the easiest notation and was the simplest to follow. To prove I could actually do this, I thought about putting up a video of me completing the Cube. But since it takes me an average of 3 minutes, I figured it might be a bit boring. So instead, here’s a video of the world record at 5.66 seconds. This entry was posted in 30 before 30, geekery. Bookmark the permalink.